There still may be a bit of summer left on the calendar, but soon the leaves will be changing color and autumn will be in the air. When that happens, all of our thoughts will turn to… Halloween! Here are some interesting tidbits about one of our favorite holidays that I found at the History Channel website. Halloween’s origins can be traced back to Samhain, an ancient Celtic festival dating back 2,000 years. This festival marked the end of summer and the harvest and also the beginning of the new year. With the new year taking place during the evolution of the autumn into winter, the festival was also associated with human death. They also believed that the line between the worlds of the living and the dead was blurred on the evening before the new year began. It was believed that the spirits of the dead returned to earth in order to wreak havoc to crops. So, during the celebration, the Celts extinguished their home fires and lit bonfires. They offered crops and animals as sacrifices. They also and wore costumes made from the skins and heads of animals to scare the spirits into going away. Once the celebration was over, they re-lit their hearths from the bonfires believing this would offer protection from the coming winter. Over the course of the four hundred years in which the Roman Empire ruled most of the land where the Celts lived, they combined two of their own festivals with Samhain. The first was Feralia, the Roman commemoration of the dead. The second honored Pomona, goddess of fruit and trees. Perhaps, this explains the Halloween tradition of bobbing for apples! The Catholic feast of All Martyrs’ Day started with Pope Boniface in the seventh century. The celebration occurred in May of each year. Pope Gregory III, in an attempt to further integrate the Celts with Christianity during the eighth century, expanded All Martyr’s Day to include all saints, too. The observance was moved from May to November 1. At the dawn of the eleventh century, the church declared November 2 All Souls’ Day as a way to commemorate the dead. The celebration included bonfires, parades, and dressing up as saints, angels, and devils. The name Halloween is derived from the Middle English word for All Saints’ Day, Alholowmesse. This changed over time to be known as All-hallows. The night before, which was the night of Samhain, became known as All-hallows Eve. Much of our Halloween tradition in the United States arrived with Irish immigrants during the nineteenth century. By the late 1800s, the holiday started looking more like the way we celebrate today. But, it was the adults who dressed up in costumes and went door-to-door asking for food or money. 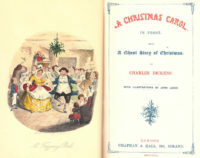 By the beginning of the twentieth century, parties with festive costumes became the norm as the superstitious and religious aspects were reduced. By the 1950s, trick-or-treating was back, but this time for all the kids born after World War II. Today, Halloween isn’t just for children. Once again it enjoys a growing popularity among adults. Although they don’t go door-to-door looking for treats, adult Halloween parties are a huge part of the tradition. Some adults dress up to take their children trick-or-treating, too. Recollections is here to help you create your dream costume for that special Halloween celebration with our period clothing and accessories! Whether you go for a traditional Victorian look, are heading back to the Old West, celebrating Downton Abbey or the Roaring 20s, are going retro with the 1950s, or are experimenting with Steampunk, our catalog will spark your imagination.